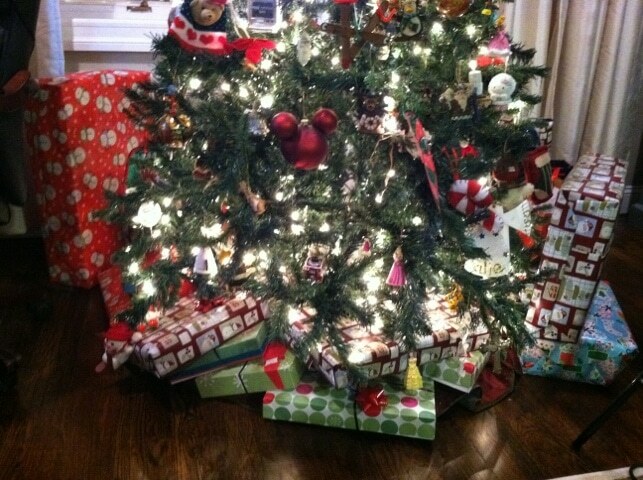 Yesterday, I finally sat down and wrapped my Christmas presents. There were so many to do! In this shot, you don’t even see the full deal. Most are around behind the tree (my kids’ stuff). I thought I’d be cute this year and put everything in boxes instead of bags. What the heck is wrong with me??? Next year, I am going to the dollar store and buying a billion Christmas bags and shoving everything in. Have you started to wrap yet? I also realized that I wasn’t done with my list. I thought I had everyone but then noticed several people weren’t complete. So, at around 3pm – I ran to the mall and tried to wrap it up. THE MALL WAS INSANE…………..
Do you hear me? Bonkers! I have one more person to buy for… and I think he’s getting a loaf of bread and some bananas….I can’t handle the mall again. dont your kids still believe in santa? Yes – santa brings them one present each on christmas morning. this is for my family and for the kids on christmas eve. I have about 12 people that come over that we exchange with. its crazy! Try online shopping – I did all my Christmas shopping online this year. It’s easy to find coupons and your get cash back from Ebates.com as well. I love it! Would be the ultimate truly refined relating to the Medusa identity. This amazing identity, set about as a result of builder Gianni Ray Ban found in 1937, is all about stunning, stunning as well as gorgeous European-style, The following equally demonstrates an excellent plain irreverent rock-star mind-set.